Upon first glance, Aardman Animations’ feature film version of its creative maven Nick Park’s Shaun the Sheep television series may seem like an innocuous, innocent, clever little trifle of a family entertainment. A sustained examination would turn up sly sophistication, percolating cinematic references (I spotted a Taxi Driver shout-out, which I heartily did not expect), and even some mild satire lurking beyond its slapsticky, kiddie-inclined hyper-cuteness. But look deep into its sunny, soothing package and you might find in Shaun the Sheep some important insights into English rural romanticism, popular disdain for the urban life that dominates the nation, and maybe even the underlying forces behind Brexit. “Sod off, you obscure pinko blogging wanker!” the Britside Twitter eggs might be saying. “It’s just a kid flick about silly sheep!” Well, it is that, yes. Made entirely in Aardman’s trademarked and comfortingly tangible stop-motion clay animation style, Shaun the Sheep Movie is also entirely without spoken dialogue, although it substitutes numerous sound effects, music, and mutterings and utterings to help get its point across so it’s far from a “silent” movie. The titular sheep is the cleverest one in the flock owned by an unnamed Farmer (who bears more than a passing resemblance to the Muppet Beaker). Shaun’s stardust memories of halcyon days at Mossy Bottom Farm open the film, with the more youthful Farmer, his dog Bitzer, and the sheep frolicking together, hugging, and generally residing in the vernal glow of happiness. But the daily routine has turned to joyless drudgery for all involved, and the sheep in general and Shaun in particular are feeling glum and alienated. Craving a bit of a break from the repetitive herding, feeding, and shearing they are subject to on the regular, Shaun masterminds a plan to neutralize the Farmer (he’s highly susceptible to sleepy lullaby music) as well as his subaltern Bitzer (a pragmatic duck accepts payment in bread to be their accomplice in this part of the scheme) and settle in for snacks and a movie in the farmhouse living room. Unfortunately, through convoluted slapstick circumstances, the old trailer they have stashed the Farmer in accidentally rolls into the big city and their master bumps his head and forgets that he was ever an agricultural entrepreneur. Shaun leads the flock and Bitzer on a quest to jog his memory and bring him home to the country where he belongs (they find they miss him after all, especially the part of the routine where he feeds them). In the unfamiliar urban environment, they must contend not only with a zealous, ruthlessly efficient goateed animal control agent who runs his pound like a prison, but also with the Farmer’s lack of recognition of his old life and reluctance to leave his successful new career as a sought-after hair stylist, a vocation which he stumbled into and which amusingly puts his wool-shearing skills to good use. 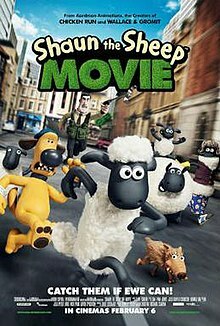 Before wading into the mucky defense of my opening critical assertion, it should be affirmatively noted that Shaun the Sheep Movie is a low-key, light-hearted delight. It’s full of Aardman’s usual inventive visual wit, a veritable gag-a-second adventure that is sure to captivate children and keep adults pleasurably involved as well. The Aardman outfit is so effective at their craft that viewing any of their products without noting the absolutely painstaking technical prowess and loving, skilled attention to detail that goes into putting even a minute of footage onscreen seems massively unfair and heartless. That the final result tends in every case to have such a good soul, a big heart, and offers such good fun is a remarkable added bonus. Shaun the Sheep also boasts the subtly impressive additional narrative feat of telling its straightforward but hardly logistically simple story without the crutch of spoken language. Its themes are simple and broad, though, and this is where we get into the weeds of politics. The realization that their big city adventure sparks in both the Farmer and his livestock is a pretty old and hoary one: there’s no place like home (though it’s not certain that his pigs, who trash his house while he’s away, have similar access to any such insight). The soundtrack even deploys a flagrantly on-the-nose Foo Fighters ballad (entitled “Home”, of course) to emphasize Shaun’s yearning to return to the safe serenity of the farm at the flock’s lowest ebb during their urban escapade. This universal longing for home is the kind of easy but resonant theme that Aardman films (and plenty of other animated children’s movies, Pixar on down) hang their storytelling machinations, madcap humour, and visual glories upon. You could firmly insist that there’s no other specific dimension to this thematic element intended or summoned in Shaun the Sheep Movie and I suppose I wouldn’t argue with you. But heck, let’s argue. When “home” is an idyllic farm in the romanticized, inherently nationalistic (and predominantly Caucasian) English countryside and its unfriendly opposite is one of the busy urban areas which house most of the country’s citizens (especially its non-white population), there’s a buried sociopolitical dimension to the construction. What social satire that Shaun the Sheep Movie has to offer is directed at the city and its inhabitants, who are busy types obsessed with fashion, status, and appearance, be it the hair stylists and their star clients, the adoring fans desperate to spot those stars, hoity-toity restaurant patrons and staff, or even the dime-store fascism of Trumper, the fanatical jerk from animal control. The comparative simplicity of rural life in Britain is not skewered in the same manner, and the farm retains its patina of warmth and authenticity. Is this all so much nitpicking and over-reading? Of course “home” for sheep would be a rural homestead; they aren’t likely to be longing for return to their council estate flat or suburban row-house, are they? But Aardman productions are consistently swathed in the traditional cloth of conservative “heritage” Englishness, a set of cultural touchstones not necessarily shared and not equally accessible to all modern Britons: Wallace & Gromit found fanciful adventure springing from one of those respectable suburban homes (often motivated by good English cheese), and Chicken Run re-imagined the heroic WWII POW camp escape caper with another countryside livestock staple: chickens (The Pirates!, in mild contrast, thumbed its nose lightly at the pompous presumption of Victorian imperialism, but then it was about high-seas outlaws, after all). But in the age of Brexit, when cynical demagogues from the far right imply a dark future of urbanized multicultural uncertainty in contrast to a sun-kissed vision of the restoration of a proud and idealized English rural (read: white and imperial) past, easy distinctions between the positive country and the negative city should responsibly be challenged, even when they occur in the midst of light-hearted cartoons.